Allseas is a global leader in offshore pipeline installation, heavy lift and subsea construction. Allseas is an expert in the execution of large and complex projects, providing worldwide support to clients from the conceptual design stage to engineering, procurement, fabrication, installation and commissioning of offshore structures. Pioneering Spirit (formerly Pieter Schelte) is the largest construction vessel ever built. Inspired by the offshore heavy lifting pioneer Pieter Schelte Heerema (1908–81) and designed completely in-house, the vessel is designed for the single-lift installation and removal of large oil and gas platforms and the installation of record-weight pipelines. The emergence of Pioneering Spirit signifies a step-change in offshore installation and decommissioning. Built at the DSME shipyard in South Korea (2011–14). Pioneering Spirit set a new world lifting record with the safe and successful removal of Brent Delta on 28 April 2017. The lift operation, comprising move in around the platform, yoke connection, de-ballasting and “fast lift”, took just 12 hours. 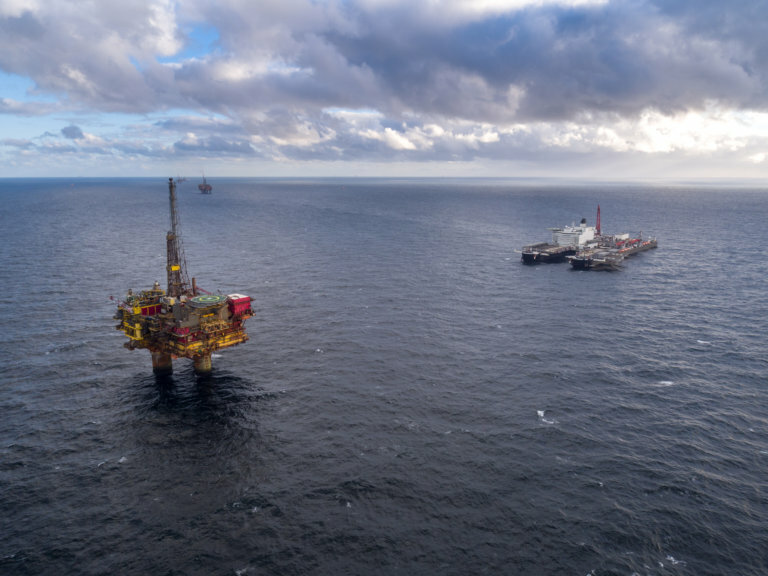 Brent Delta was Allseas’ second decommissioning job, following the removal of the Repsol Norge-operated 13,500 t Yme mobile offshore production unit (MOPU) from the Norwegian sector of North Sea in August 2016. The twin-hulled vessel is 382 m long and 124 m wide. At the bow is a slot, 122 m long and 59 m wide, that enables Pioneering Spirit to straddle a platform and remove entire topsides – up to 48,000 t – in a single lift using eight sets of horizontal lifting beams. Two tilting lift beams for the installation and removal of jackets – up to 20,000 t – will be located at the vessel’s stern. Complementing the lifting systems is a 5000 t special purpose crane for additional lifts such as lighter topsides and jackets, modules and bridges. As a result of her unique lifting capacity, Pioneering Spirit will significantly reduce the amount of offshore work associated with platform installation or decommissioning, largely moving this work to shore, where it is cheaper, safer and more environmentally friendly.